I create sculpture using ceramic clay, polymer and Apoxie clay. so these figure prominently as my favorite subjects! And later this month I'll be having an auction on eBay of my nautical themed artwork. Twenty five percent of the proceeds will go to The St.Baldrick's Foundation for childhood cancer research. so in High School I took three years of ceramic sculpture classes. My parents saw I was really into ceramics so they bought me my own electric kiln! Soon after I started selling my work at arts & craft fairs then later at galleries. My first creation was a medieval castle complete with a moat that I sculpted when I was in the 4th grade. The teacher showed it to a friend of hers that owned an antique shop. The owner bought the castle for her shop and my teacher used the money to buy us a class pet. to over a month to finish a piece. from the original King Kong movie. crab and tentacled creature that attack the sailors trying to rescue Fay Wray. 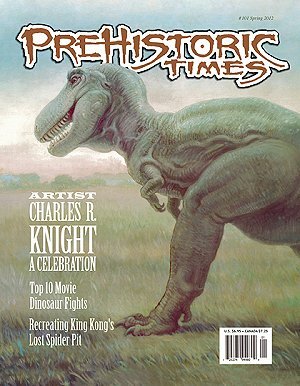 was just published in issue 101# of The Prehistoric Times magazine.. I've always been fascinated by the work of stop motion animator Willis O'Brien. It was his imagination and attention to detail in bringing Kong and the other creatures of Skull Island to life that are largely responsible for making King Kong the enduring classic it has become. Right now I'm working on a bust of Kong chomping on a native. It is going to be released as a resin model kit by Gillman Productions later this summer. In a nutshell - keep your word! It will stand you in good stead overtime. Thanks so much for sharing and good luck with the fundraiser, Brian! Fellow Artists, if you want to be the next interviewee, just email me! King Kong is still eating natives after all this time? Guess he can't kick the habit! lol. great stuff... great classic stuff! Awesome interview, Brian's work is amazing! Brian is brilliant! I love his work. Thanks for doing such a great interview! I do too! And thank you! It was my pleasure!